We have been conditioned to believe that there is no gain without pain – or should we say no loss without pain – especially when it comes to losing inches around our body. While a healthy lifestyle is important, a supplementary wellness regime could bring us closer to the body we desire. Ayurveda is especially rich in its knowlegde of herbs, powders and oils that could work on the persistent fat that rests at all the wrong places. A therapuetic massage holds the power to unblock body energies and release toxins, giving not just an instant slimming result, but also improving metabolism. These green chemical-free rituals take us a step closer to our wellness heritage. With a focus on the traditional Indian sciences of yoga and Ayurveda, Ananda in the Himalayas, Uttarakhand creates a synthesis between age-old therapies and modern spa technology. The personalised therapy and activities programme are designed to meet individual needs and health goals — detoxification or deep relaxation, anti-ageing or weight and inch loss. “Improper body toning is the result of improper distribution of body and low activity levels leading to poor musculature. We all have a six-pack below but it is covered by a layer of subcutaneous fat. A combination of Udhwarthana and stimulating shower blitz practiced at Ananda significantly improves body toning,” says Dr Shijoe Mathew, Ayurvedic physician and wellness consultant at Ananda in the Himalayas. Udhwarthana is a deep, dry massage that uses herbal powders to break down the body’s excess subcutaneous fat, address obesity and mobilises toxins. The drying nature of powders and the unique motion which is towards the heart and thus opposite of the blood flow has an immediate impact on this subcutaneous layer or the kapha nature of the body. Amidst pine forests in the hills of Kasauli at the Niramaya, Baikunth Resort, on the spa menu is an exotic mud bath that contours the body and tightens the skin. As a part of this therapy, the body is wrapped in a muddy blend – pure mud mixed with rose, curd, vegetable juices, fruit extracts and sandalwood powder. “Body packs made of dashmool, triphala, goharu and turmeric powder followed by hot fomentation for 10-20 minutes also help in fat dissolution and distribution,” states Dr Garima Thakur of Baikunth Resort. The hot and cold fomentation therapy to the abdomen helps localised muscles to strengthen and tighten up. The reshaping body wrap available at Spa la Vie by L’Occitane works to tone the skin, stimulate fat release and promote toxins elimination. Almond tree bud extract, which is rich in flavonoids to drain excess fluids, is associated with a plant-based complex and almond proteins to firm the skin and redefine body contours. While the wrap is on, a relaxing foot and scalp massage promotes a feeling of complete well-being. Another almond-based therapy, called the silhouette reshape preps up the body for summer holidays, treating cellulite and restoring firmness to the body. A draining massage with the almond supple skin oil targets the thighs, stomach and buttocks to build skin’s elasticity and reduce the appearance of stretch marks. Its patented complex combines the contouring, anti-water-retention and anti-fat storage properties of almond proteins, essential oils and caffeine. Conveniently located in the heart of New Delhi at Janpath, the Imperial Spa & Salon is etched with distinct Mughal influences. The signature Savassana wrap plus is a detoxifying scrub and mud wrap to purify and energise from within, destressing the body and mind. 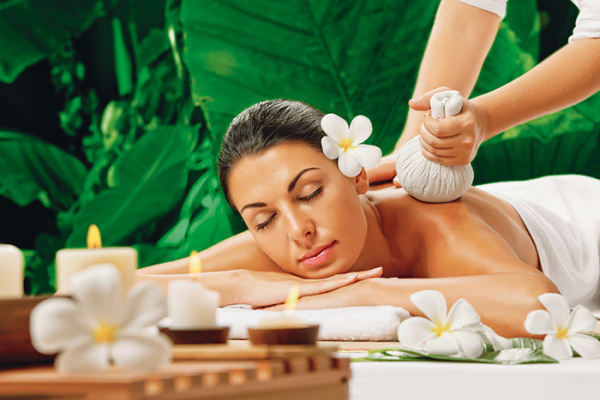 The treatment includes exfoliation and a balancing massage that eliminates toxins and encourages lymphatic drainage. A thermo blanket assists with purification on a deeper level. “Our state-of-the art thermo blankets and thermogenesis, can potentially encourage guests’ bodies to be stimulated to increase energy expenditure and fat oxidation — a key factor in fighting obesity,” states Hayley Louise Dack, director, The Imperial Spa. A must-try when you want to cheat and get rid of water retention instantly to slip into that LBD before a special evening. Jivaniya, an invigorating treatment at the Jiva Spa, Usha Kiran Palace, Gwalior relieves muscular tension and improves blood circulation besides reshaping the body. The exfoliating herbal scrub made of spices such as black pepper, clove, cinnamon, nutmeg, cardamom, ginger and kalonji stimulate heat and help in improved blood circulation. It also controls edema (vata) in the body and hence aids in body shaping. The Kairali Healing Village, Palakkad (Kerala), extends an indulgent invitation with its lush environs and traditional rituals. Opt for Podikizhi if you are sincere about dropping a size. For this, kizhis or bundles made of herbal powders are warmed and pounded over the body with moderate pressure for a specific period of time. This therapy relieves spasm, stiffness of muscles and joints while reducing obesity and flabbiness of muscles. Kadikizhi, another ‘bundled’ therapy relieves rough skin, high blood pressure and dilutes lymphatic nodes. Muslin-cloth poultices made of dried plants and flowers are steamed in a detoxifying herbal decoction. The skin is first prepped with medicated oils to maximise the efficacy of the steamed herbal bundles. The slimming effects of these treatments are difficult to quantify as they vary according to individual body metabolisms; however regular exercise and a healthy diet can sustain their effects significantly.